Theresa’s now infamous quote to a working nurse that there’s “No Magic Money Tree” to pay NHS staff a decent wage falls into stark relief as we hear stories of heroism from our front-line services treating victims of terrible attacks in Manchester and London. But how do you cut throughout the rhetoric and counter-rhetoric to find some clarity on a contested area? 10% of the world’s wealth hidden. But this is very specific to this campaign and to this group of Conservatives, whose senior figures are personally implicated and profit from this. Of course this hidden wealth is essentially theft, and it’s worth repeating that the entire narrative generated and maintained by the media is almost exclusively focused on a very different threat, that of the scroungers and the feckless poor. This is all laid out very clearly. We’ve known since 20111 that at least 50% of Tory funds come from City and we know to that the Conservative plans for the NHS centre around Jeremy Hunt’s Naylor Report which sees our health welfare as a “source of untapped value”. So there’s a neat symmetry in which the nurse is patronised but her own hard work is exploited for more wealth to the already super-rich. That we live in a wealthy country disfigured by poverty and inequality and where the media plays a vital role in exerting a propaganda to support that elite rule is becoming more abundantly clear every day. This week we can do something about it. (1) ‘Economists say the ultra-wealthy are dodging taxes far more than we think’. 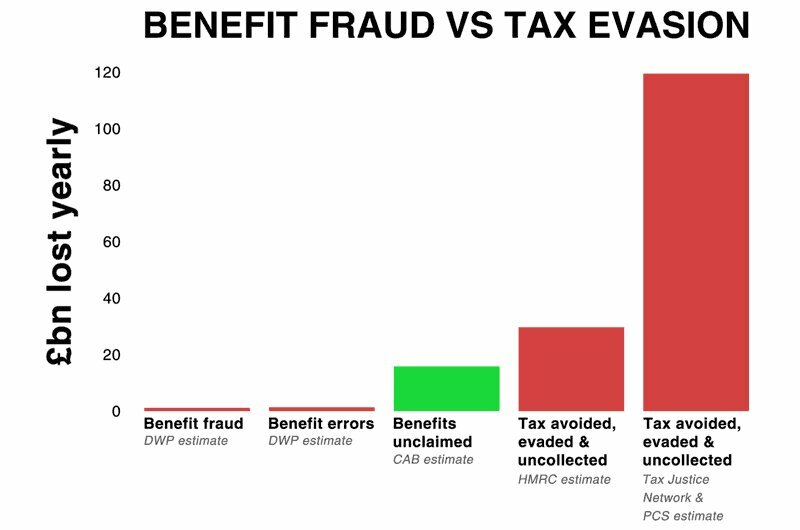 The individuals who avoid taxation through “sheltering” their money in offshore tax havens justify their actions by claiming that they earned it through their own efforts (ha ha) and don’t see why they should share or contribute anything to the society in which they operate. They should be deported to a desert island/tax haven of their choice and left to their own resources. In many of those places,their favourite mantra,”there is no such thing as society”,is a reality. Cake and eat it too comes to mind. The ‘leakage’ from the UK economy is actually much worse than even this suggests. Annual surpluses from privatised ex public utilities, mostly taken offshore by owners given operating monopolies by successive Westminster governments (energy, ports, airports, water etc), are vast. As these ‘businesses’ tend to be leveraged transactions, their inflated debt levels also help reduce tax liabilities. Inflated land/asset values and interception of rents (e.g. via high prices) within the UK are also extracted from ordinary consumers and taken offshore taxfree. The global rich and famous ‘own’ all of this via secretive offshore ‘funds’. 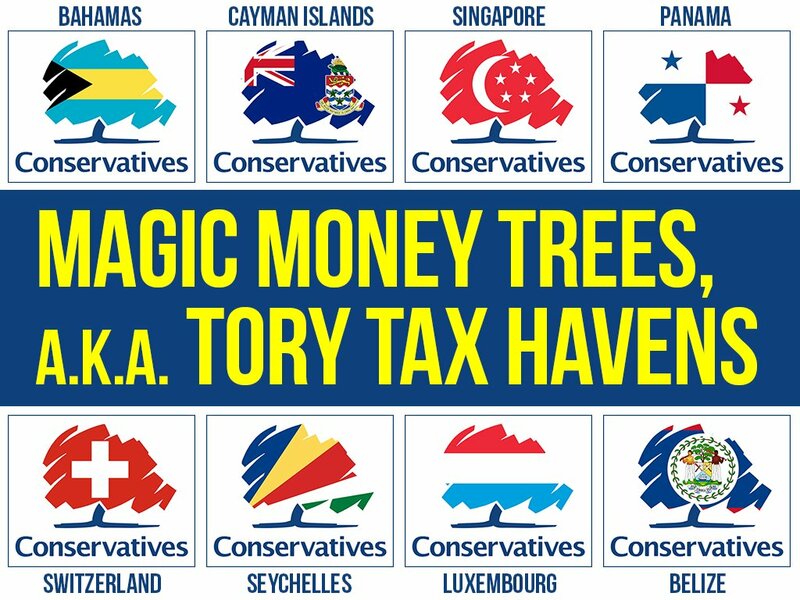 The money tree example does however indicate that a savvy government would find it relatively easy to raise billions in extra taxes. A refusal to do so indicates whose pockets the politicians are really in. As Mrs May is a big fan of the Naylor report, this suggests that NHS England&Wales’ assets are also heading towards offshore ‘funds’ if the Tories get back in. Scotland will be next, although SNP seem to have already been ‘dabbling’ with equity funds (housing? ), which are probably an even worse long term option for ordinary Joe Public than PFI. Coincidentally I’m reading a book (No Expenses Spared) about the MP expenses scandal of about ten years ago. I remember reading about it at the time but to have it summarised, along with highlighting the efforts that MP’s made to try to block access via the Freedom of Information Act to their expenses claims, truly is jaw dropping. Claiming 8 pence far a carrier bag will give a good idea of how greedy they were. At the other end, the Sky’s the limit. Hint – ask Gordon Brown about it next time you see him. He does love watching football. I doubt much will have changed other than the MP’s finding new ways to hide their plunder of tax payers money. You forgot to mention the magic money tree in which banks make money out of thin air and then lend it under the name of quantitative easing. 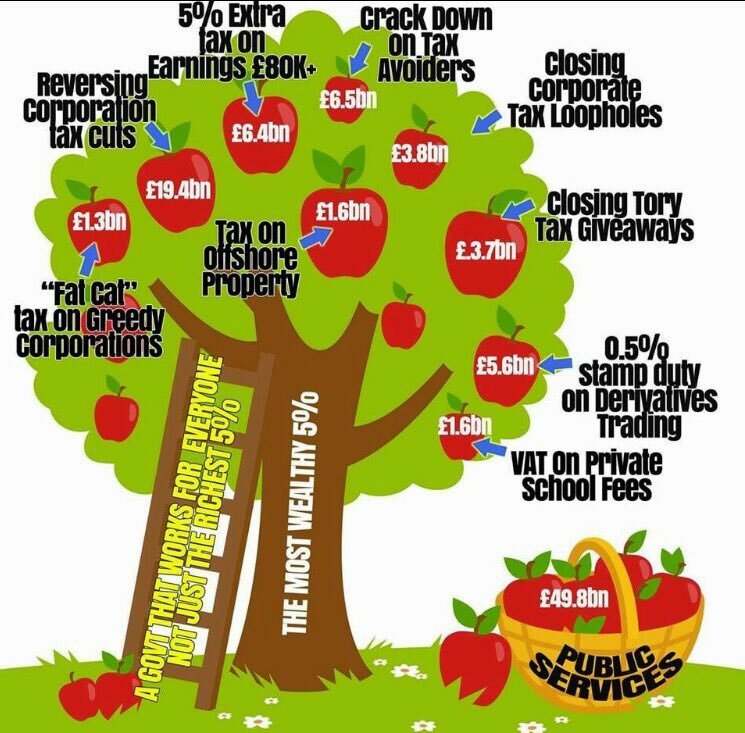 What is quantitative easing (government printing money) but a magic money tree? What are the inflated salaries and bonuses of the financial sector and corporate executives but skimming from a money stream and filling their buckets from a money tap? What desert in inherited riches? What of conflicts of interest in self-enriching legislators, or selling of honours, traditions of British politics for centuries? Or the self-serving holders of public office who use their privilege to charge fees for access or to mouth paid-for questions, or as a springboard to lucrative future careers, or simply charge fortunes for speaking engagements? What of the recipients of bribes and those who bribe them, money changing hands to defraud taxpayers and obtain worse value for money public purchases? Some of these practices are discussed in more detail in editor David Whyte’s book How Corrupt is Britain? Yes, there are money trees, and money streams and secret money islands, but only the rich and powerful are allowed to own and recognise the existence of these parasitic treasure sources. Cheers, @Editor, I will have a look at Treasure Islands if I can get hold of the new edition. From silver spoons to the civil list, it seems that some people can conjure up money in a way denied to others. I am currently reading Edward Bellamy’s Looking Backward: 2000–1887. A character explaining the future socialist utopia makes the point that we are all inheritors of all those who have contributed to civilization for millennia before us (trees of ancestors and trees of knowledge if you will) and to cut some out of that inheritance is an injustice of capitalist-industrialist society.